At what point was this instituted or commonly found. In general, but specific to a Winchester 1892? I thought it was the 1920's, but I'm aware of a late teens Winchester with such a barrel. Replaced, or not? Correct me if I'm wrong, but I seem to recall an 1894 rifle I own dating from 1918 and an 1892 rifle I own dating from 1921 don't have it. Both rifles are not easily accessible at this time. I think I would recall them having the logo as I don't find it to be particularly attractive. So, after 1921? Does this differ for carbines? More than likely the barrel is not original if it is on a pre-1920 production gun. The stylized barrel logo you mention "WINCHESTER" was first used on the Models 53 & 55 in 1924. It was shortly used thereafter on several other models (as supplies of the older barrels were used up). That's what I thought! The gun in question is a 1917 1892 carbine in the 825,000 range. This was a very good barrel swap as all components do not appear refinished and the barrel condition reflects that of the rest of the firearm. This gun probably began life as a .38-40. Correct me if I'm wrong, but I don't think the .32-20 or .25-20 receivers accept a .44-40 barrel. As far as I know, the barrel shank diameters are the same for all the various calibers, but the magazine tube hole diameter is different (smaller) for the 25-20 & 32-20. More than likely the barrel is not original if it is on a pre-1920 production gun. The stylized barrel logo you mention "WINCHESTER" was first used on the Models 53 & 55 in 1924. Why do you state "more than likely the barrel is not original if it is on a pre-1920 production gun"? What significance is the "more than likely" part of the statement, as what would make a less than likely occurrence of this happen on a pre-1920 firearm? Madis does a poor job of describing the advent of this Winchester trademark logo. Are you, or can anyone, cite a reference as to when exactly this appeared? Appears to have been concurrent on some 1892s in 1924 and after once the Model 53 came out. This is actually quite important as the owner of this 1917 carbine thinks I've lost my marbles. If the gun in question is a Model "1892", and it was truly manufactured in the year 1917, the barrel is Not original... do you feel better now? The reason I used the phrase "more than likely" is because I personally do not know if the gun in question was manufactured in the year 1917. For all I know, it is actually an early 1920s production gun. Many people still use the Madis DOM information, and in the case of the Model 1892 and 1894, he was off the mark by several years. Why not provide me with the serial number, and pictures of the gun in question... I am sure that I could then dispense with the "more than likely" phrase. I saw the gun at a gun show a few weeks ago but don't have photographs. The six digit serial number started with 825. I do not recall the last 3 digits. A serial number of 825xxx was applied to a Model 1892 receiver during May of 1917. That is all we know. When the receiver was actually married up to the rest of the components to make up a full rifle is unknown for this SN range. The reality of when the rifle was manufactured is unknown. 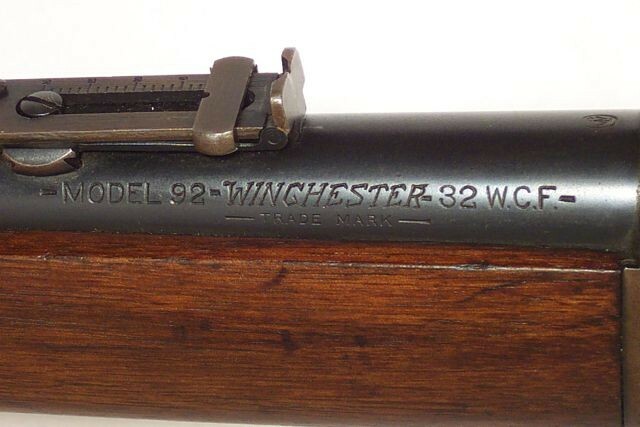 The usage of barrels with the stylized "WINCHESTER" on the left side begins to appear on receivers which were serialized near the end of 1925. 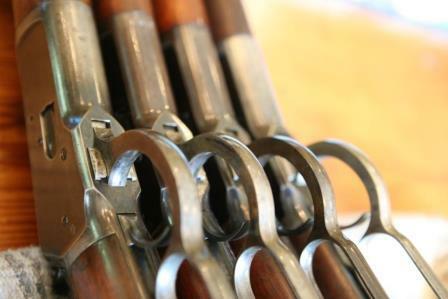 As is/was typical of Winchester the transition is not a sharp one but stretches over a range of about 6000 rifles. You can also determine the approximate age of the barrel by the position of the rear sight dovetail relative to the face of the receiver. Begining in 1927 the dovetail was positioned further from the receiver face to allow for longer buckhorn style sights to be mounted on the carbine barrel. I hope this helps. Let me know if you have further questions which I might be able to answer. Thank you! Even though the barrel looks like it has been with this carbine forever, it obviously has not. I don't think Winchester was in the business of manufacturing large numbers of receivers and fitting them with current production barrels years, even decades, later. I suspect that this barrel was switched many decades ago because someone wanted a .44-40 carbine or the original .44-40 barrel warranted replacing for some unknown reason. Unless it was switched recently using a barrel that reflects the condition of the rest of the gun with intent to deceive. Please note this is in reference to a CARBINE, not a rifle. I don't think Winchester was in the business of manufacturing large numbers of receivers and fitting them with current production barrels years, even decades, later. Most receivers were most likely married up into full working rifles with 3 to 12 months. But I most certainly have found numerous examples of a receiver not being used until 2 to 5 years later. BUT, this is most often found on special order and unique configuration rifles. It is my belief that this is a result of those receivers being judged as having a superior finish and reserved for higher paying customers.